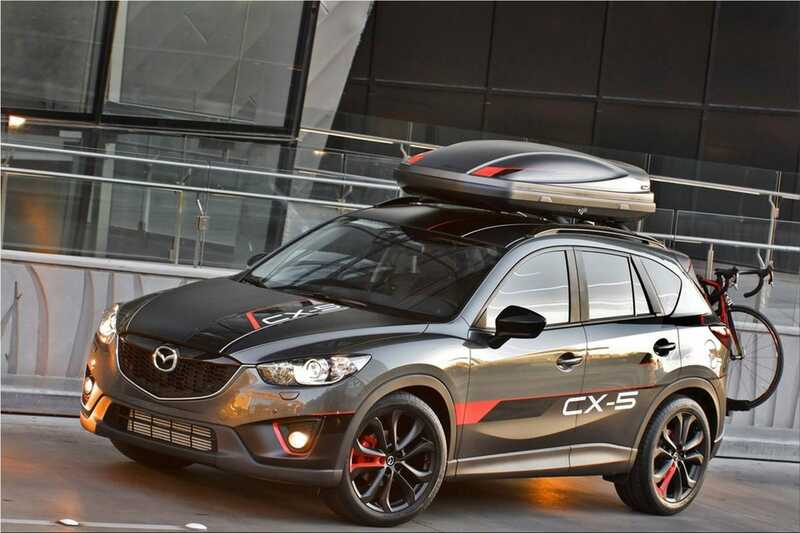 The Mazda CX-5 Dempsey not only features actor and race car driver Patrick Dempsey's name but it was developed with his competitive passions in mind - motorsports and cycling, to be more specific. Throughout his professional racing career, Dempsey and Mazda Motorsports have been familiar friends with Dempsey seeing seat time behind the wheel of an RX-8 in the GRAND-AM Rolex Series. 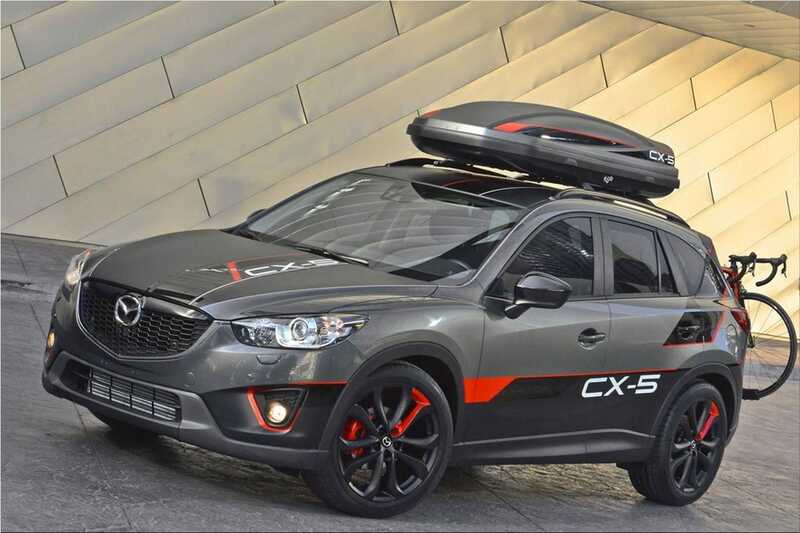 Sleek, sporty and stylishly dressed to take care of business, the CX-5 Dempsey features a high-contrast custom paint scheme of glossy grays and matte blacks with bright red highlights. 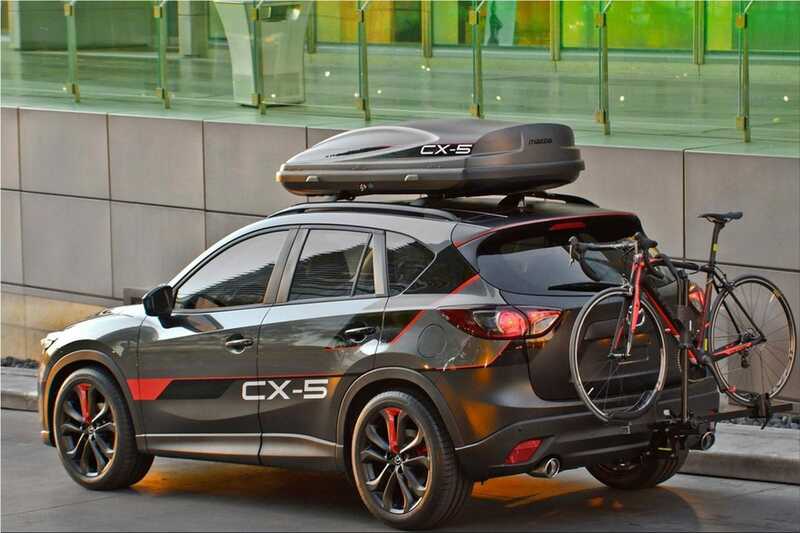 Outfitted with a Specialized Bicycle S-Works Tarmac road bike and a Thule Atlantis rooftop cargo box, no road is unexplorable, whether it be a mountain trail or Manhattan traffic. 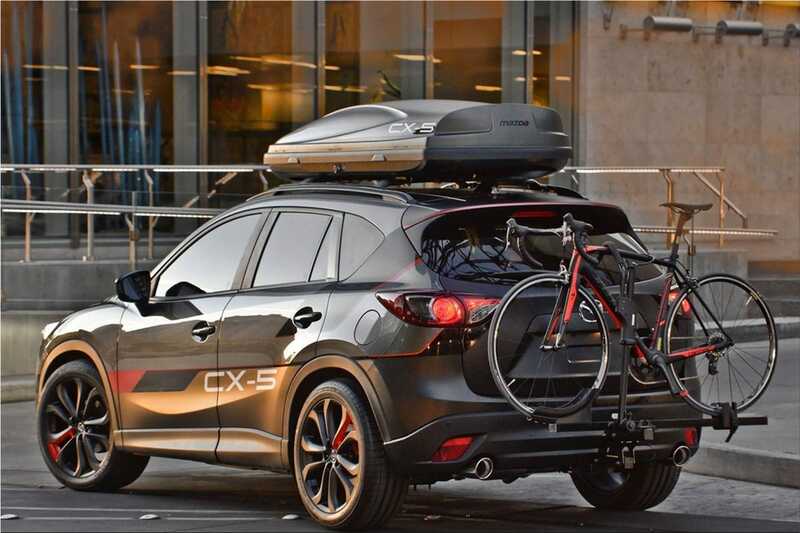 Under the hood lurks a European-specification SKYACTIV-D 2.2-liter clean diesel engine to power the all-wheel-drive system, meaning no road is a challenge either. The high-power clean diesel offers a low 14:1 compression ratio with an output of 129 kW at 4,500 rpm and 420 nM of torque at 2,000 rpm. 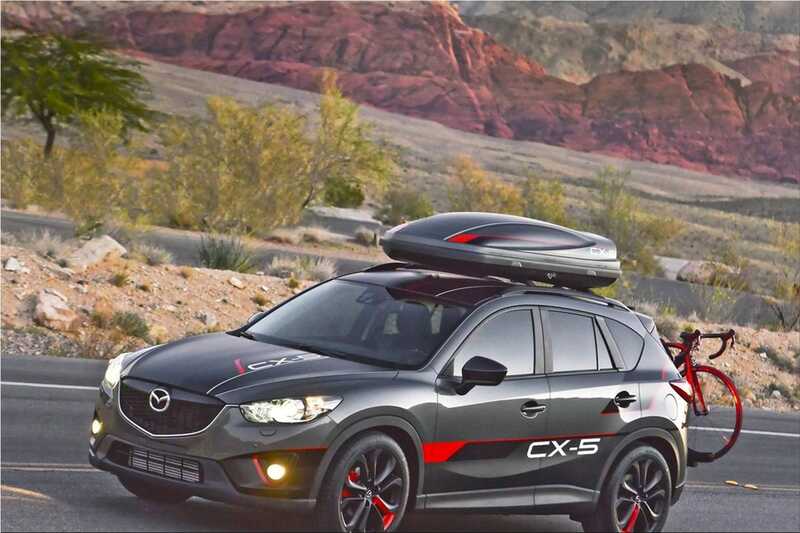 Mated to a SKYACTIV-MT six-speed manual transmission, the Mazda CX-5 Dempsey offers racing-inspired dynamics and down-right driving fun - two things usually lacking in the compact SUV segment. 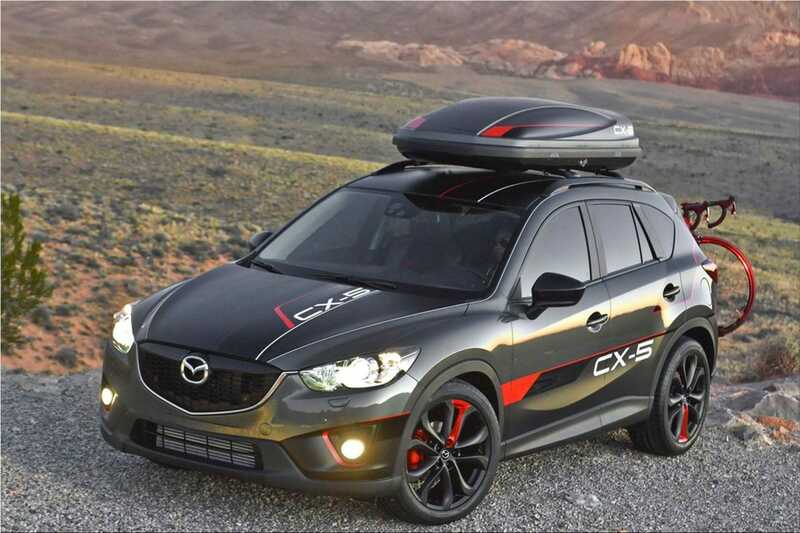 The vehicle sits on Mazda Design-customized 20-inch black chrome alloy wheels encased in Michelin Latitude® Sport 255/45ZR20-sized all-season tires. 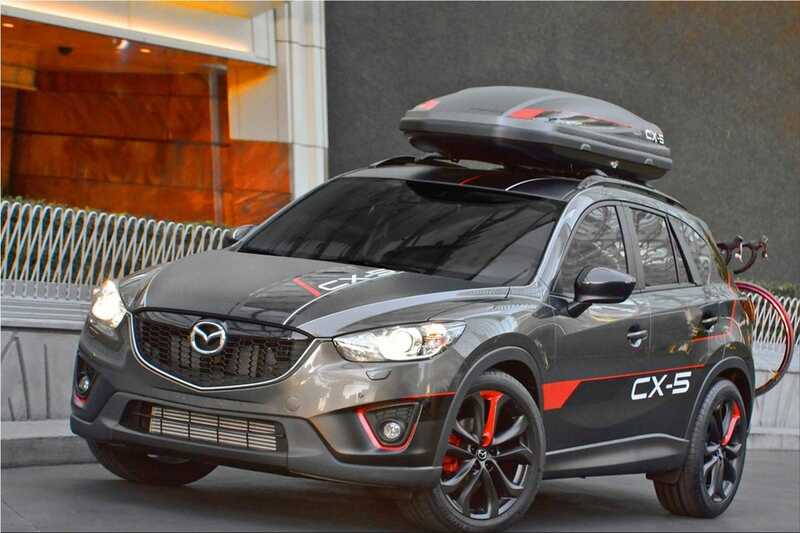 Each wheel is highlighted with a single double-spoke painted in glossy Luminous Red, a color used in a limited fashion yet makes an appealing visual impact to the Mazda CX-5 Dempsey. 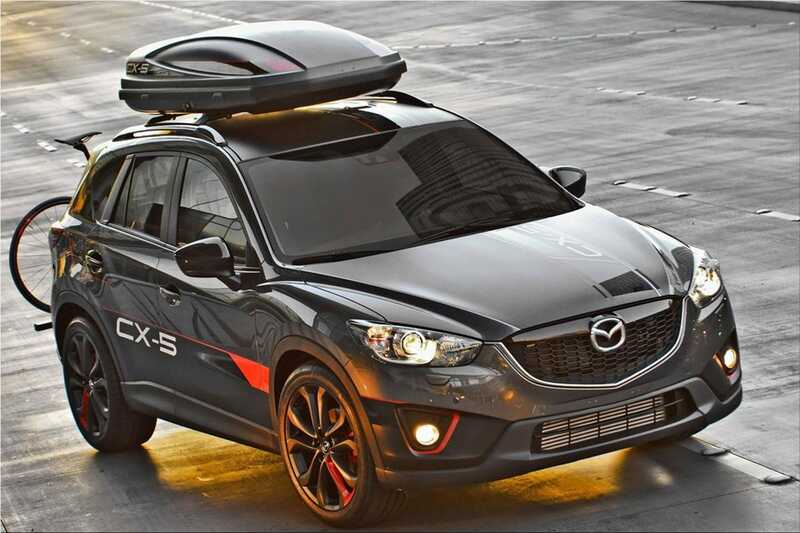 Satin chrome touches in the Racing Beat dual exhaust complete the athletic ensemble. 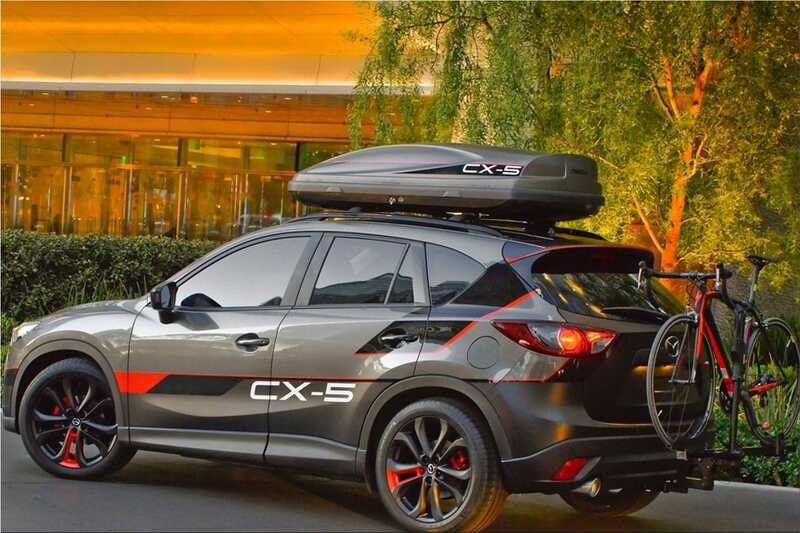 The exterior color scheme was developed in coordination with the high-performance, competitive architecture of the Specialized Bicycle road racer. 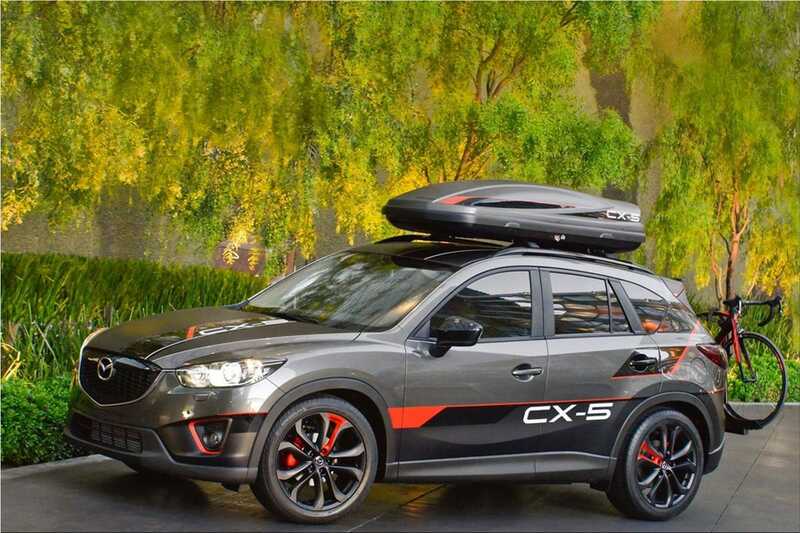 Secured to the rear of the vehicle via a Mazda factory hitch and Thule T2 carrier, the S-Works Tarmac SL4 Red features a Carbon Satin carbon fiber frame with Red Keyline highlights. 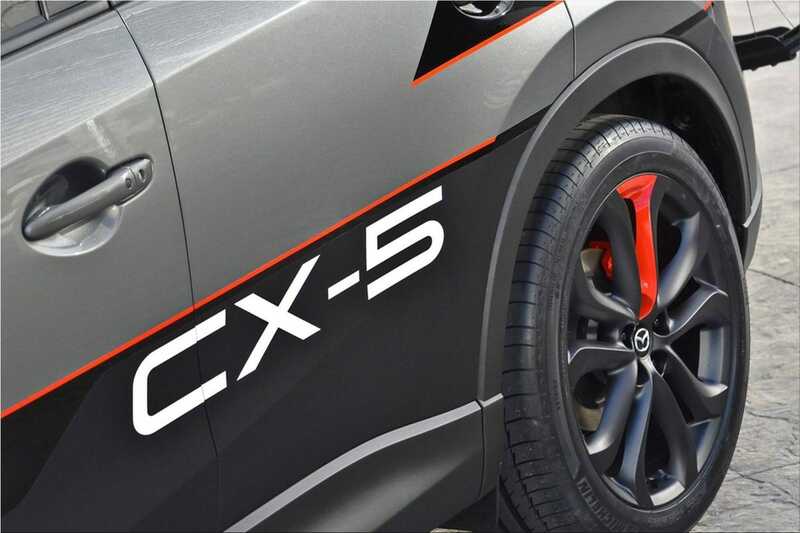 To match, the Mazda CX-5 Dempsey is receives a glossy Anatomy Gray paint base with thick strips of striking Brilliant Black. 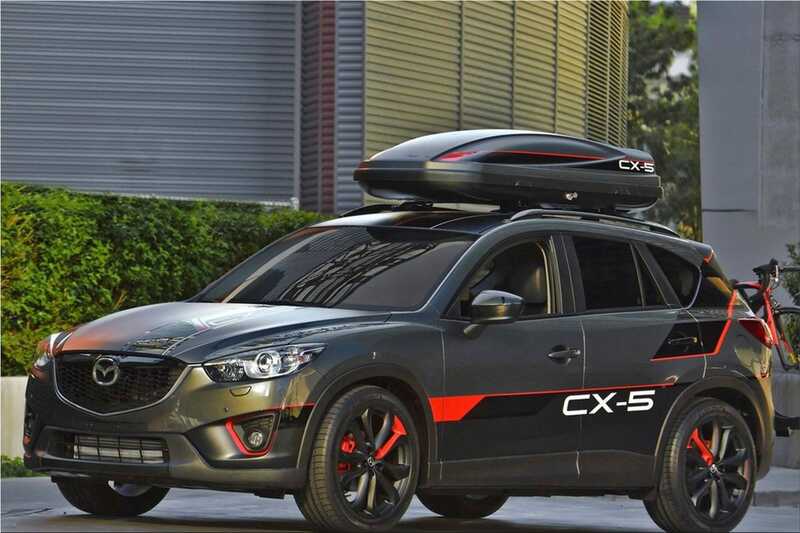 Luminous Red graphic lines separate the dark layers as Bright White borders and "CX-5" decals emblazon expansive surfaces such as the doors, hood and cargo box. 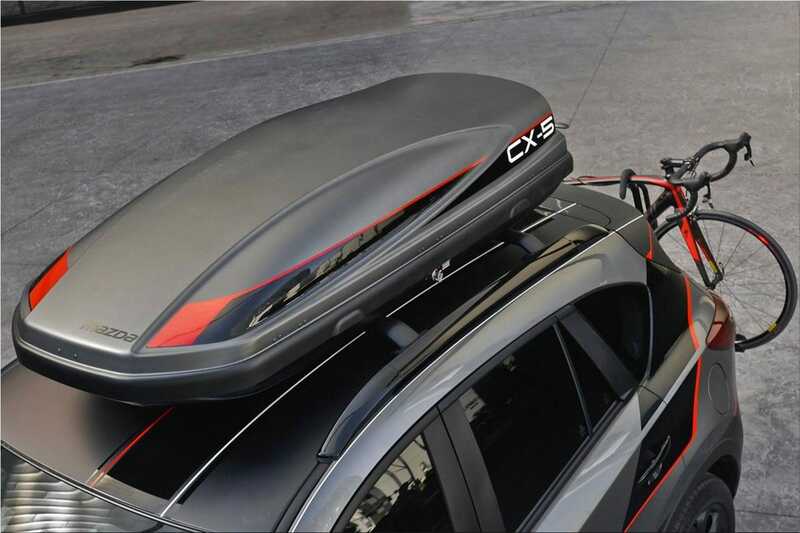 A Black Mica matte finish details the entire tailgate and continues across the lower portion of the vehicle as well as along the roofline to complete the bicycle's Carbon Satin look into the front hood. The design theme evokes a rugged functionality and tempered finesse. The composed aggression is maintained throughout the interior as well. Black perforated leather inserts are nestled within gray aniline leather bolsters featuring red accents which correlate directly with exterior graphics. 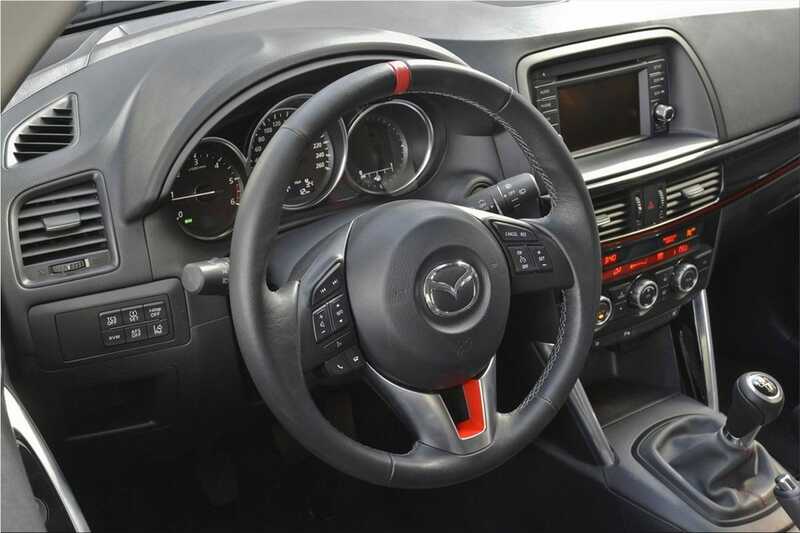 All leather wrapped, the steering wheel, shifter boot, armrests, door panels, center storage bin as well as front and rear seats feature contrasting Luminous Red stitching. The full-length decorative panel is custom painted in glossy Brilliant Black and features a single Luminous Red outline with a Bright White vehicle model imprint. 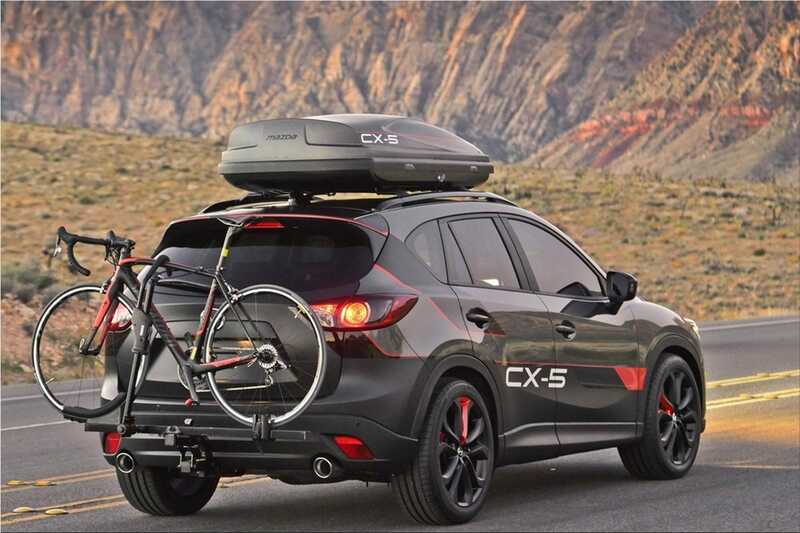 The Mazda CX-5 Dempsey conveys the ambition and awareness that beats within the heart of any competitor, regardless of the race route.